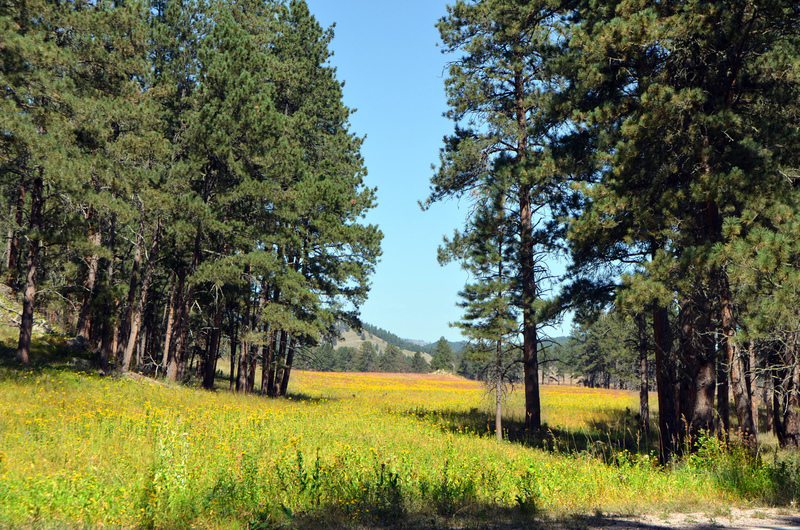 September 1st, 2015 – Black Hills, SD – When I stumbled onto the Iron Mountain Highway I was really just headed towards Wind Cave National Park, and the campground there. I finally arrived at dusk, saw a ranger talk, and spent the night. In the morning I did a quick walk through of the visitor’s center and out through the park. I put “take a tour of the cave” on my “come back and do later” list. As it turns out the ranger talk greatly improved my appreciation of this park and the ecosystems it represents. 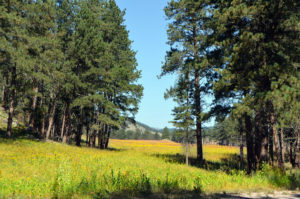 From Mount Rushmore, down the Iron Mountain Highway, heading to Wind Cave you pass through Custer State Park. Beautiful curvy road, don’t expect to make good time, and be ready for Bison on the road. 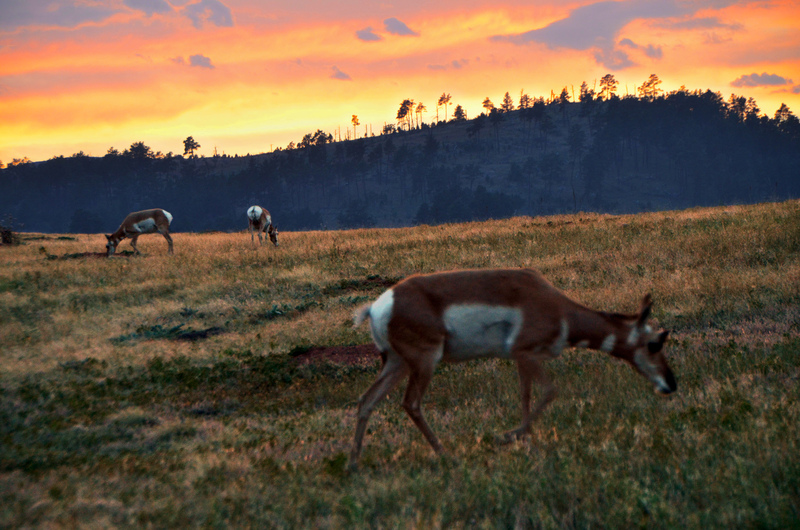 It looks like Custer could be a great place to camp. When I passed by the “State Game Lodge” area I was pleased to find I had 4G signal. Almost made sense given the dense population of campsites in this large open area in the otherwise dense woods. I might have stayed, but when I went online to reserve a spot I got all the way through and had made peace with spending a little more on the campsite. The cost of the campsite was one thing, but *after* I got all the way through the reservation process (happily before I paid) it then indicated that all vehicles *also* needed a state park use permit. One for the car, one for the trailer, and they weren’t offering to sell it online. I’m sure I could have worked it out, found some ranger or something, but the experience really rubbed me the wrong way, so off I went, out of Custer State park and on to Wind Cave NP. Wind Cave NP’s grasslands are beautiful, a bit more open than Custer, in the parts I drove through. 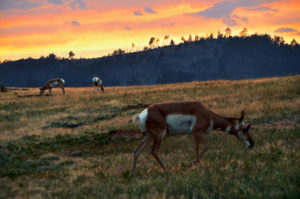 I arrived at the camp just as the sun was going down, and was greeted by a large herd of Pronghorn grazing by the road. Made for some great pictures. As I was driving into the campground, the ranger was along the road and he invited me to a talk that was starting in a few minutes. I hurried to pick my spot and get set up and joined about five minutes into the talk. He explained how Wind Cave National Park is a large prairie above ground, as well as the extensive cave system underground, and they manage it as such. The Bison herd here is separate from the herd in Custer State Park, and they use fences to keep them separated. While prairie dogs have been widely eradicated through the region, they have a large population here in the park. Their studies have found that Bison calves grazing on the clipped grass in prairie dog towns gain weight faster than elsewhere. They have even reintroduced Ferrets into the park as they are the natural predator of prairie dogs. He showed some very compelling photos of how they are using fire as a tool in the park. 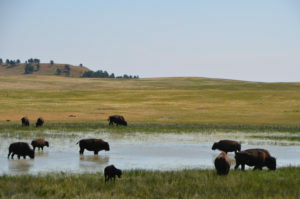 They had burned a piece of grassland, and within three weeks Bison were grazing happily on the higher quality grass. Apparently Bison will come back to burnt areas regularly favoring them over places that haven’t burnt in a long while. They also use fire to control the edges of the forest. During a fire small seedlings around larger trees act as a ladder for the fire to allow it to burn the entire mature tree, whereas small grass fires just lick the base of the tree and do no harm otherwise. The forest is always sending out seeds and unless there is something to keep it back the grassland would be gone. He explained how at first the park tried to keep the reintroduced Bison, Elk and Pronghorn in corrals. This was in response to the disappointment of visitors who were unable to see them having come a very long distance with that hope. But the animals didn’t fare well in this penned up environment, especially as they were being fed corn and not eating their natural foods. As they let the animals wander they found that while Bison prefer the grasslands, the elk prefer the woods. 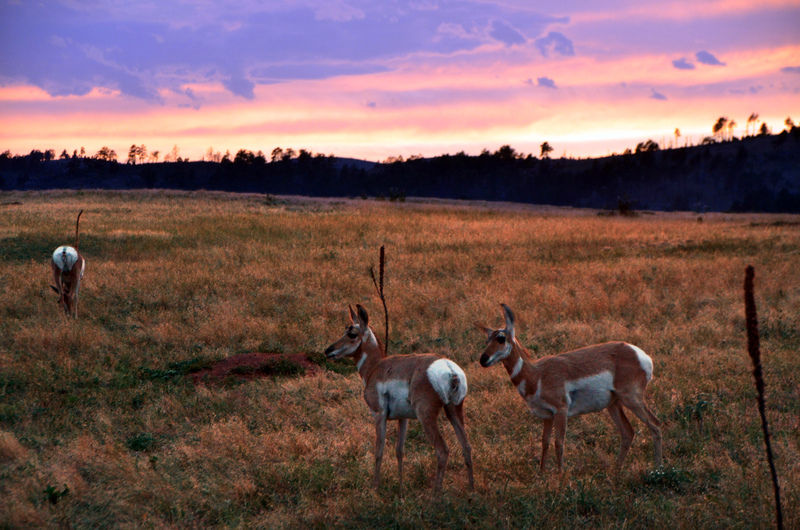 Further while these both like to graze, the Pronghorn actually prefer the flowering plants and not the grasses. He explained how they determined that runoff from the visitor’s center parking lot was making its way into the cave and contained oils from the asphalt. So they redesigned the parking lot to use concrete and to channel as much of this through above ground treatment as possible. 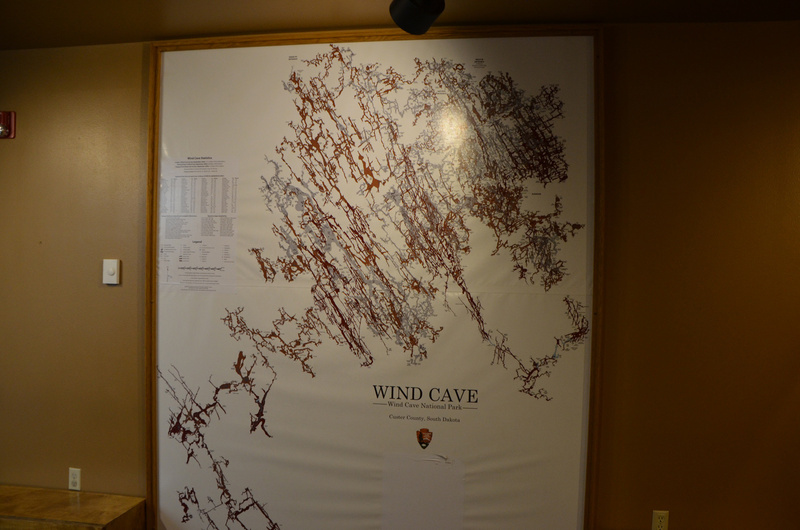 The visitors center has a nice set of displays about the history, ecology and geology of the cave and the prairie above it. Here they explain that the cave has its name because air rushes into and out of the small openings as the local atmospheric pressure rises and falls. As they built bigger entrances the cave’s ecology changed with more ready airflow and became much drier. In response they built air locks on the larger entrances. Tours of the cave are available from the visitor’s center, but I really wanted to drive the Needles highway and then make some tracks east. So I put I made note of this for a future visit. Rolling hills, the plants and trees were quite varied.